Is there another country anywhere with so much diversity? The six million inhabitants of this nation of mountains and islands are spread over 463,000 km2 of mountainous tropical forests, and speak over 800 different languages (12% of the world total). Papua New Guinea occupies half of the second largest island in the world and 160 other islands and 500 named cays. Located just south of the equator and to the north of Australia, PNG is a diver's paradise with the fourth largest surface area of coral reef ecosystem in the world (40,000 km2 of reefs, seagrass beds, and mangroves in 250,000 km2 of seas), and underwater diversity with 2500 species of fish, corals, and molluscs. There are more dive sites than you can shake a stick at, with many more to be discovered, and barely a diver on them. The dive centres are so far apart that there is only ever one boat at any dive site. 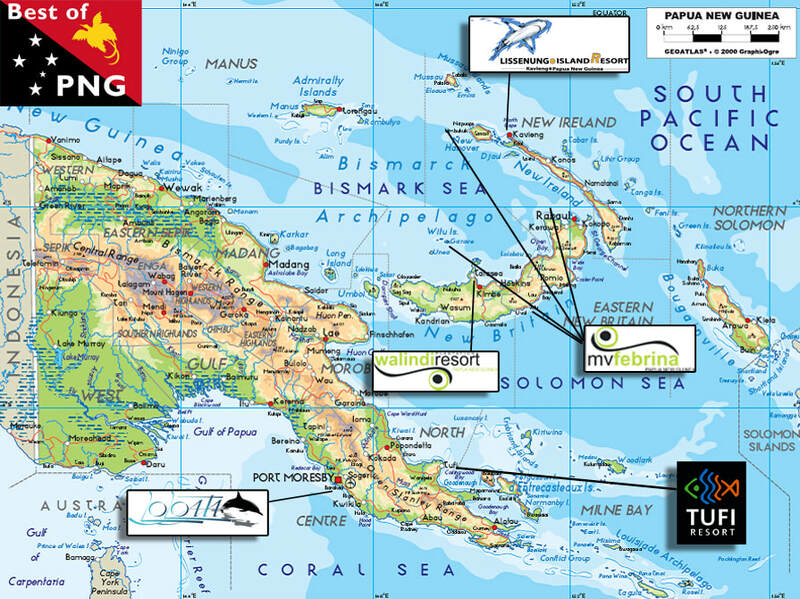 We've been diving, exploring and touring Papua New Guinea since 2010. Our Managing Director, Christopher Bartlett, has logged over 700 dives in the country, spends 2 months a year in country checking up on service providers, leading cultural tours to festivals, birding, and exploring new spots for new trips in the highlands regions and the Sepik. We have established close-knit relationships with local in the highlands, leading to some exceptionally rich experiences for our more intrepid clients. Our team on the ground in the Asaro valley ensure that you arrive as a client and leave as a friend. We doubt that you will find another tour operator with our breadth of experience and knowledge covering diving and land tours. Our network of contacts with the local airlines and resorts is well-nurtured and close and we fully understand both the intricacies of travel in PNG and our client's various and differing requirements. We represent PNG resorts at international dive and travel shows in Europe and the USA and are an approved PNG Guinea inbound tour operator, see the PNG Tourism Promotion Authority website here. We have been involved in remote-location tourism, from expeditions to luxury travel for the best part of 15 years. We are an international company, with bank accounts in USD, GBP, EUR, and AUD, amongst others, and accept card payments. It is one of the few places left in the world where a diver can see macro critters, pelagics, and big stuff, as well as fantastic soft and hard corals. The often misused and abused adjective “pristine” is actually appropriate here, due to low fishing pressure in the area in comparison to other areas of the Coral Triangle, no dynamite fishing, and thanks to a system implemented by dive resorts whereby local reef "owners" receive a small fee for every diver that visits "their" reef. As a result elders make sure that the reefs are not fished. Best of PNG creates tailor-made itineraries to the four best dive resorts in PNG, Tufi, Lissenung, Rapopo, Walindi (and the liveaboards FeBrina, Oceania, and Golden Dawn), as well as cultural trips, Highland sing-sings, Sepik River mini-expeditions, outrigger safaris, bird watching and mountain treks. Using our expertise and local knowledge, we endeavor to create the perfect trip for every client, matching the right resorts to individual and group desires. We organise all your internal travel arrangements and Port Moresby stop-overs as well as flights from Brisbane, Cairns, Singapore, Manila, Hong Kong, Kuala Lumpur, Nadi and Honaria. ​You pay the same rates as if you booked directly with the different resorts, hotels, and operators, but to just one company. You can also pay the resorts directly.Called “the land of a million different journeys”, PNG is one of the last places remaining off the tourist radar with less than 10,000 visitors each year.